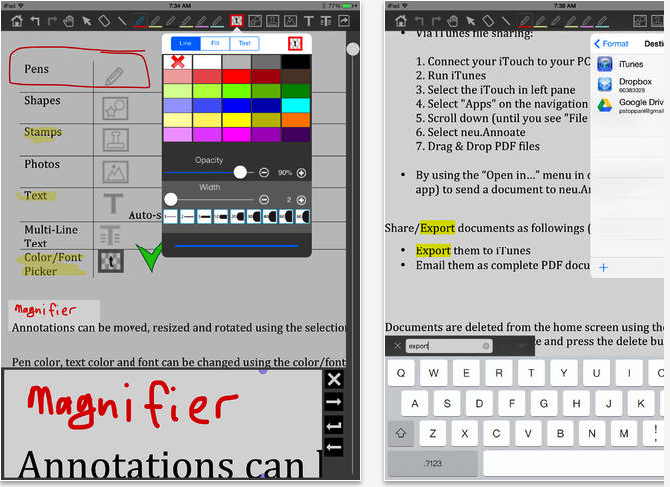 Eu.Annotate is an iPad app that allows you to read and annotate PDFs. The app is available or free today and only for a limited period. We have just downloaded it and gave it a try and it seems pretty handy. Using Neu.Annotate, you will be able to add a wide range of annotations to your PDF documents such as drawings, highlighting text, adding text notes and photos. You can also add your own free-hand writing and fill-out and sign documents. "Annotated PDF files can be shared via email as well as exported to iTunes and Dropbox. Individual pages can also be shared in PNG and JPG formats, in addition to PDF." "PDF files can be opened in neu.Annotate from any application that supports the "Open with..." menu command. This includes Mail, Safari, Box, Dropbox and many others. PDF files can also be imported using iTunes File Sharing, Dropbox, and WebDAV services". Other features from en.Annotate include: organizing documents using tags, inserting blank pages, searching documents, controlling feature restrictions, adding table of contents to docs, locking documents so they can not be modified, grouping annotations and many more.